This month marks roughly seven months since the release of Things 3 for iPhone, iPad, and Mac — a major update that introduced a completely rebuilt suite of apps featuring an all-new design language, a highly polished UX and an incredible set of features that managed to win us over in our review. Cultured Code had been heavily criticized for their slow updates leading up the release of Things 3, but over the last 6 months, the team behind the app have worked on and pushed out some wonderful updates. Today, the team is releasing Things v3.3 — a Free update that introduces a new ‘Mail to Things‘ feature. The Mail to Things feature opens up a whole new world of possibilities for you to empower your Things 3 experience. 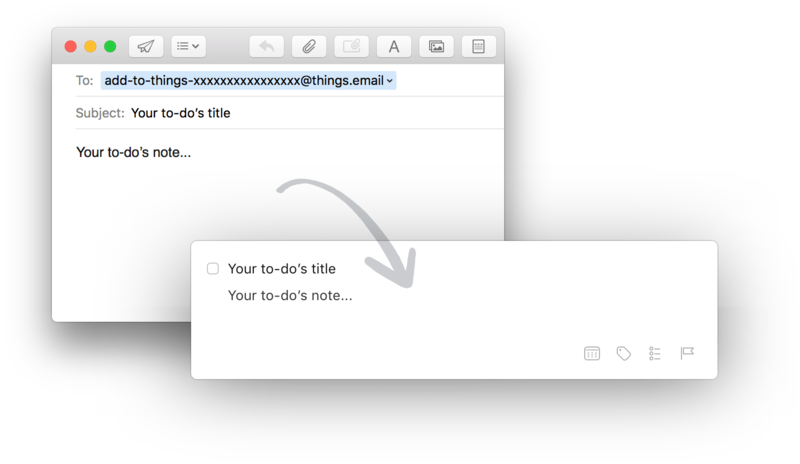 As the name suggests, the feature lets you email To-Dos to your Things Inbox. Powered by the Things Cloud, Mail to Things is very easy to use — the email’s subject becomes the Title of your To-do while the email body goes into the to-do’s notes. With this, you can now create To-Dos from practically anywhere. Email is something that is available in almost all apps and devices, so you can easily share any page, content, message, etc. as an email and it’ll be readily available as a To-Do in your Things Inbox. Embracing a common channel like Email also means that you can build powerful automated workflows using apps and online services like Workflow, IFTTT or Zapier. You can check out some example workflows for Mail to Things that the company has created, or craft some of your own. Unfortunately, Mail to Things is a little too simple in its current form. Right now, there’s no way to add a To-do to a specific Project or add tags to it. I’d love to see this feature getting updated with a set of syntax options that I can specify in the email body. Things 3.3 is now available for iPhone, iPad and Mac and is Free Update to existing users.